Herbert Hoover writes to Edward Nash Hurley about the difficulties in shipping sugar. I should like to recall your attention to my previous communication on shipping needed for our import supplies. The requisitions of the War Department on shipping are filling me with the utmost apprehension. The removal of Hawaiian steamers has already made it impossible to transport the full amount of November and December sugar and in consequence the sugar famine in the northwest will spread rapidly into other states. This is only one instance of what is happening. It seems to me desirable to review to you the absolutely minimum necessities that we must import into the United States during the next twelve months as to which the larger proportion will need to be imported during the first six months of the period. Porto Rico - 550,000 "
West Africa - 25,000 "
Sundry food - 100,000 "
I cannot emphasize sufficiently the absolute, critical necessity of having these tonnages brought to this country. Sugar is looked upon as a luxury but in fact the dietary of civilized people is so much dependent upon being tied together with sugar that a population will lose heart more quickly from the loss of this food product than from the loss of practically any other foodstuff except bread. The human animal requires a certain minimum of food and if you take the sugar away from the American people they will simply have to eat the same tonnage of other products and as our total export capacity in foodstuffs to the Allies amounts in maximum to 12,000,000 tons, if you take the imported sugar it means a decrease in our exports by that quantity and already our supplies to the Allies are less than they can endure with. Molasses is fundamental to the manufacture of industrial alcohol, vegetable oils are fundamental to the manufacture of glycerine. I have entirely omitted from the above list the 300,000 or 400,000 tons of tropical fruits and many other foodstuffs that could be lopped off in an emergency. Under the most stringent control rationing we cannot reduce our sugar intake by more than 25%, which is in fact the whole of the reduction which the Allies and Germany have been able to caccomplish without injuring their several populations. The above tonnage already allows for a considerable reduction in our sugar consumption as it includes a large amount of imported sugar for re-export to the Allies. 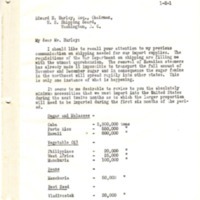 I think it is only right that I should ask from you some assurance that these tonnages will be transported and I want this letter to form a record from the Food Administration against failure to provide the American public and the munitions brances with commodities for which I have responsibility. Hoover, Herbert, 1874-1964, “Herbert Hoover to Edward Nash Hurley,” 1917 November 5, WWP19244, Hoover Institute at Stanford University Collection, Woodrow Wilson Presidential Library & Museum, Staunton, Virginia.